The main objective of DAMOCLES is to reduce the uncertainties in our understanding of climate change in the Arctic and in the impacts thereof. The variability of sea-ice thickness, extent, concentration, ice-type and drift will be monitored by remote and in-situ systems in near real-time. Sea-ice dynamics and thermodynamics will be scrutinized to better understand their role for the largescale ice-atmosphere-ocean system. Aimed at a better predictability of the Arctic weather and climate key processes are investigated in a combined observational/process-modelling effort: the effects of Arctic cyclone on sea-ice in terms of heat and moisture transport, an improvement of boundary-layer physics over ice and ocean, an improvement of the radiative transfers and its interaction with snow and sea- ice. An observational system will be set up with the aim to improve the understanding of the large-scale circulation of the Arctic Ocean and its vertical and lateral exchanges as well as the communication between central basins and the shelves. New techniques will be used to assess synoptically the state of the ocean under the ice and the fluxes of heat, salt and volume across the boundaries. Model sensitivities will be investigated and performance be improved by model-model and model-data comparison, aiming at an improved predictability. Observations will be enhanced by a set of assimilation activities to deliver reanalysed Arctic variables in time and space. To address the question of potential impacts of climate change in the Arctic the observationally supported model improvements, the model sensitivities and past ranges of variability will be combined with new field data. The aim is to evaluate improved predictability and its consequences, as well as the impact of projected changes on adaptation capabilities and vulnerability of the environment and human activities. DAMOCLES will not work in isolation – it serves the European community. Exploitation and dissemination of the results are key elements of the project. Therefore, a website will be available; giving the community updated information about the state of the Arctic (e.g. real-time information of key atmospheric, ice and ocean variables) as well as information about the progress of the science of DAMOCLES. Education will be provided, through workshops and student scholarships. Results will be published, both in scientific journals and in the popular-scientific press. The PIs will generally make themselves available to the public to the best of their ability. The contribution of OASys to the DAMOCLES project consists of the setup and analysis of an adjoint code of the NAOSIM couples ice-ocean model and the performance of data assimilation …. In close cooperation with the FastOpt and the Alfred Wegener Institute for Polar and Marine Research. DAMOCLES is funded under from 2006-2009 in the 6th Framework of the European Commission under Priority 1.1.6.3 “Global Change and Ecosystems”, see the Commission's own description of the DAMOCLES project here. DAMOCLES is a european contribution to the International Polar Year 2007 - 2008. Gerdes, R, Hurka, J, Karcher, M, Kauker, F, and Köberle, C (2005). In: Climate Variability of the Nordic Seas. Bjerknes Centre for Climate Research, Bergen, Norway, Bjerknes Centre for Climate Research, Bergen, Norway. Harms, IH, and Karcher, MJ (2005). Karcher, M, Gerdes, R, Kauker, F, Köberle, C, and Yashayaev, I (2005). Kauker, F, Gerdes, R, Karcher, M, and Köberle, C (2005). Journal of geophysical research 110(C12002). Polyakov, IV, Beszczynska, A, Carmack, EC, Dmitrenko, IA, Fahrbach, E, Frolov, IE, Gerdes, R, Hansen, E, Holfort, J, Johnson, VV, Karcher, M, Kauker, F, Morison, J, Orvik, KA, Schauer, U, Skagseth, HL, Sokolov, VT, Steele, M, Timokhov, LA, Walsh, D, and Walsh, JE (2005). Goose, H, Gerdes, R, Kauker, F, and Köberle, C (2004). Gerdes, R, Karcher, MJ, Kauker, F, and Schauer, U (2003). Karcher, MJ, Gerdes, R, Kauker, F, and Köberle, C (2003). Karcher, MJ, Kulakov, M, Pivovarov, S, Schauer, U, Kauker, F, and Schlitzer, R (2003). In: Siberian River Runoff in the Kara Sea: Characterisation, Quantification, Variability and Environmental Significance, edited by Stein and Fahl and Fütterer and Galimov. Elsevier, pages 47-69. Kauker, F, Gerdes, R, Karcher, M, Köberle, C, and Lieser, JL (2003). Rinke, A, Gerdes, R, Dethloff, K, Kandlbinder, T, Karcher, M, Kauker, F, Frickenhaus, S, Köberle, C, and Hiller, W (2003). Karcher, MJ, and Oberhuber, JM (2002). Harms, IH, Karcher, MJ, and Dethleff, D (2000). Journal of Marine Systems 27:95-115. Harms, IH, and Karcher, MJ (1999). J. Geophys. Res. 104:13431 - 13448. 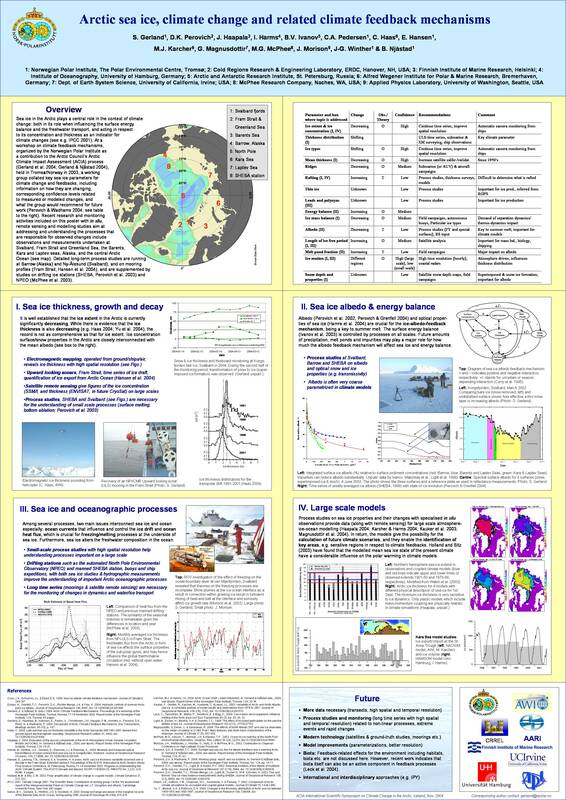 Gerland et al., Arctic sea ice, climate change and related climate feedback mechanisms, Poster at the ACIA conference Reykjavik, Iceland, 2004. Karcher et al., Arctic Ocean change in the 1990s: impact on riverwater pathways and freshwater export, Poster from the Arctic Science Summit Week ASSW in Potsdam, Germany, 2006.